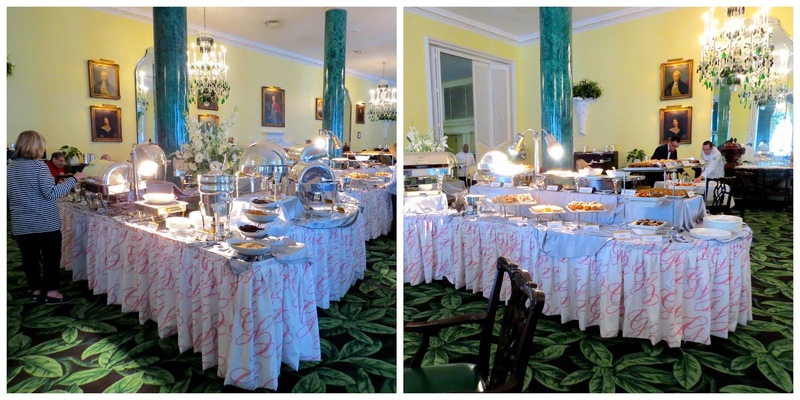 Our last morning at the Greenbrier, we decided to have the big buffet breakfast in the Main Dining Room. They have this breakfast every day, but it is rather expensive and large! Since we eat so much for lunch and dinner, we try to make breakfast the lighter meal of the day. I tend to overdue it on buffets! Anyone else have that problem? But we were spending the rest of this day in the car driving home, so I decided to load up on breakfast! There is a menu offered in case you don’t want the buffet. My husband was the only one to order off the menu. He had the oatmeal with honey and berries. I did check out the menu, but I just can’t pass up a buffet! It’s a problem! The meal started with an amuse bouche from the chef. I’d never had one for breakfast before. Love the idea! It was a grape and apple smoothie with a piece of pineapple on top. I decided to skip the omelet station because those tend to fill me up and then I can’t eat much else on the buffet. Another part of my strategy! I ended up getting three plates of food. Here is my first plate. I always have to have bacon…LOVE IT! Then I wanted to try the berry bread pudding and the cheese blintzes. Rounding off this plate was the quiche, cheesy potatoes and crumb cake. If I don’t like something a lot, I will leave it. I was brought up having to clean my plate, but I am letting myself off the hook for that now. I only eat the things I really enjoy. On to plate two! Since I am hypoglycemic, I need protein for breakfast. Luckily, I love eggs and bacon, so once I get those covered, I can indulge in the sweets. If I just ate sweets for breakfast it would not be good for anyone. I feel terrible and act terrible within a few hours. I finished off with some fruit. It looked and tasted delish! Always makes me feel good to end with something healthy. Overall, it was a great breakfast buffet with a few things on it that I had never had before (like those potatoes with gruyere cheese sauce). I always enjoy breakfast food and trying new things. I also like the special details (like the amuse bouche and presentation of the cream cheese). The butter was served in a little dish with the Greenbrier “G” on it. Love this! I actually did this once for a fancy breakfast I was hosting. I used candy molds that I sprayed with Pam and then put in softened butter. Once they sat in the freezer for a while, they popped right out. Very fun for breakfast or brunch parties. 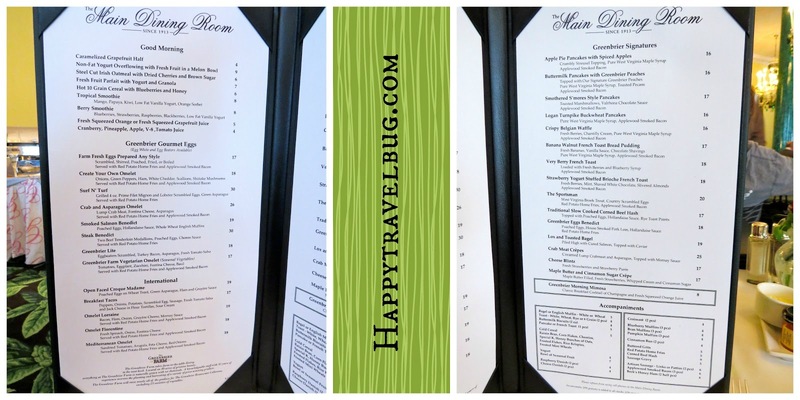 Check out what others are eating at Peasandcrayons.com & FoodieTuesday. What is your favorite thing to eat for breakfast or brunch? Buffets are so much fun! I really should learn to browse before taking though 😉 The quiche looks good…and the bacon too, of course! I have a similar buffet strategy of scoping out the tables and planning accordingly. Glad to know I'm not the only one! I also skip things that I can easily make myself at home, like toast, and I don't feel guilty if I just have a couple bites of something. That berry bread pudding and the cheese blintzes look delicious. I would not have passed on those either. Kudos on getting some healthy fruit in there. Sounds like we have the same plan! I admit to loving buffets too but always have food coma afterwards. I have a strategy too though not as good as yours:) Although, I'm not a big breakfast person, I can really go for this buffet. Love your options of healthy and mouth-watering and something new. The potatoes with gruyere cheese sauce sounds interesting. All your Greenbrier posts have really made me add this to places I need to visit. I hope you make it to the Greenbrier one day. If so, let me know! I need to find a good sushi buffet! I love the huge variety of a buffet and thanks for the tip on the cute butter pats. I love buffets, for the variety and because I can overindulge without feeling too conspicuous or guilty. Everything looks fantastic, especially the butter with the little 'G' – a nice touch! Yes, I love butter too.